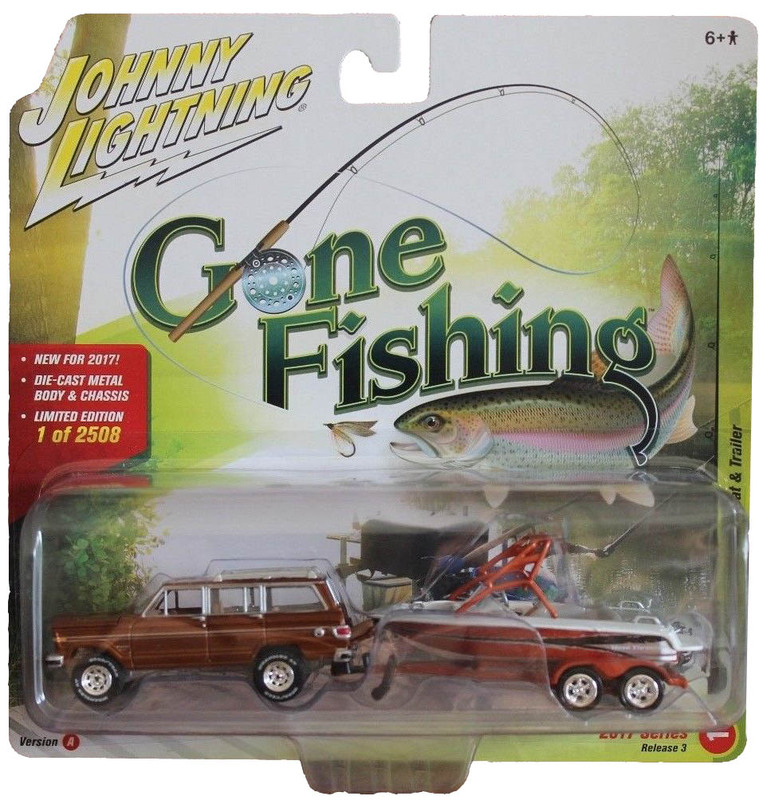 Johnny Lightning did a nice "Gone Fishing" series of 1/64- scale vehicles and boat trailers in 2017, including a 1981 Jeep Wagoneer in brown or black. Nice graphics on the card, so I thought we should add it here at the top of this 2002 page of "Gone Fishing" Jeeps. We know that in many cases the best way to get to the best fishing spots is by Jeep. So what better place to photograph toy Jeeps, especially models that are particularly designed for outdoor sports, than on their way to those fishing spots? This photo created by Mike Albright features the "White Water Outfitters" Grand Cherokee made by Mighty Mo's. The background is Marymere Falls in Washington state. 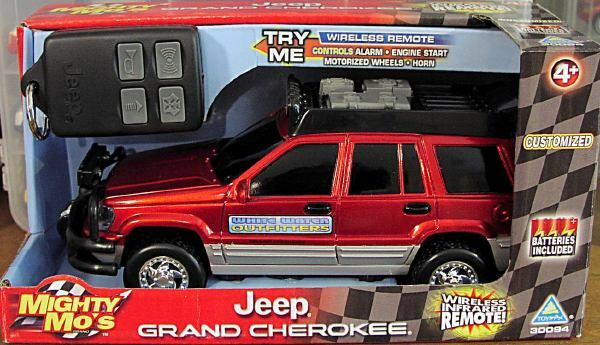 See also the Jeep in the box (50K JPEG), with the keychain wireless remote control. Part of a 1999 Racing Champions "adult collectible" series of small diecast vehicles paying tribute to Field & Stream magazine, this TJ Wrangler helps the Park Ranger keep an eye on what's happening upstream. See also the packaging (50K JPEG), with a reproduction of an old Field & Stream magazine cover. A Mini-Tonka Jeep with a fish emblem on the side. See also a rear view photo showing the spare tire and jerry cans molded into the plastic soft top. This was part of the "Bass Beater" set, with a boat and trailer. Tonka also sold a Mini-Tonka "Coleman Camping Set" with a yellow Jeep, a canoe and tent (see the Jeeps in Playsets page). Most fishing rods on a toy Jeep! The boys came all the way up from Florida to try their luck on the Olympic Peninsula in Washington state, where Mike Albright took the photo at Kalaloch Beach. This is one of the 1/43-scale CJ-2As from Matchbox Collectibles. Not all the good fishing spots are in the north woods. The Matchbox "Salamander Tours" Wrangler, with a fishing rod in the lugagge rack, is seen here on one of the many islands off the coast of Venezuela. I made some comments about this toy on the Matchbox Jeeps 2001 page. I think this might have been the first photo I did of a Jeep toy in a real-world setting, back in the mid-1990's. 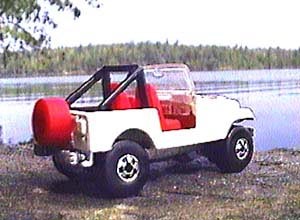 Since this Hot Wheels CJ-7 had a fishing rod molded into the rear floor, I wanted to show it beside the lake. The picture was done by taking the Jeep up to Sharbot Lake and shooting it with a VHS camera, rather than by combining photos using Photoshop. Pretty low-res by today's standards, but I still like it. Hope you enjoyed these photos. You should see the ones that got away!